A video has been snatching edges around social media! No, it’s not Starkeisha slamming her fist in some girl’s face. 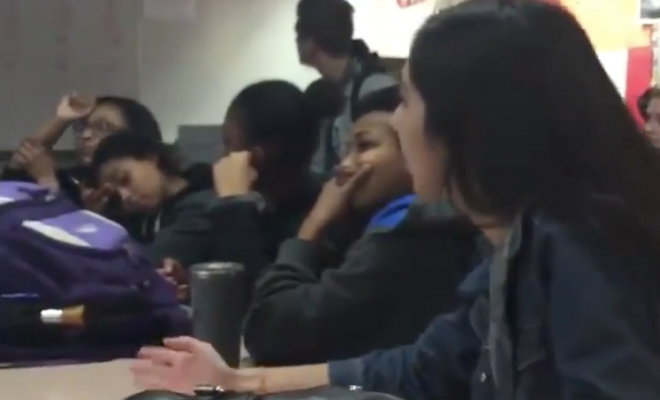 What looks to be a high school student in a classroom talking to her teacher about white privilege. The subject is racism and it seems the teacher gives his thoughts on what he believes racism is. I once believed that anyone can be racist but that was until I started listening to other points of view. First, Noah Webster was a white man who created America’s first dictionary. So it is technically a white man’s definition of racism. Racism is based on the systematic oppression of people. This high school spoke that truth in just 31 seconds. Take a look below at the video. I don’t know who she is but she did that and I loved it. She spoke the truth and it was in a respectful way considering she was in a classroom setting. There is a storm brewing of angry Caucasians that believe that black people are racist. This storm is what is pushing Donald Trump to be our next president. They’re slowly losing their grip and they are not going down without a fight. There is another storm brewing, though. Young teenagers are waking up and questioning some things and the system that wasn’t designed originally for some of them. Although the presidential election is important please know that local elections truly make your voice heard. People of color can not be racist they can, however, be prejudice. Learn from this. How do you feel about this young lady’s thoughts did she have a point?